This is a sponsored post written by me on behalf of Elizz for IZEA. All opinions are 100% mine. As a women in my mid 50's I have experienced many different roles so far. Daughter, grand daughter, wife, friend, mother, care-giver. All of these roles had positives and some negatives, and I have been grateful of the experiences. My story is a little different than many women my age, as I was raised by my grandparents. My grandparents were in there late 50's when I came into their lives….just imagine. As a young women with a baby on my hip I was a caregiver for my grandparents as they aged, struggled with illness and eventually passed away. I was 30 years ahead of my time, as most of my friends are going through the experience of looking after their parents now. I remember the stress of caring for my grandparents and my small children at the same time. I was exhausted and felt that my responsibilities would never end. I hear the same stress in my friends voices as they talk about how they are dealing with their elderly parents and I know how they feel. There are different levels of care-giving, some that last for a short term and some that are full time responsibilities that can last for years. Wherever you are at, there is help for the caregiver too. The caregiver needs support as well. Just recognizing the cues to burn out is important, knowing when we need help, is essential. A company I have recently heard of called Elizz offers caregiver coaching, group support, nurse advisor's, online counselling and respite care when you just need to take a break. If you are now in the role of caregiver, don't wait until you are at burnout, take a minute now and see what type of services Elizz has that could support you in your situation. 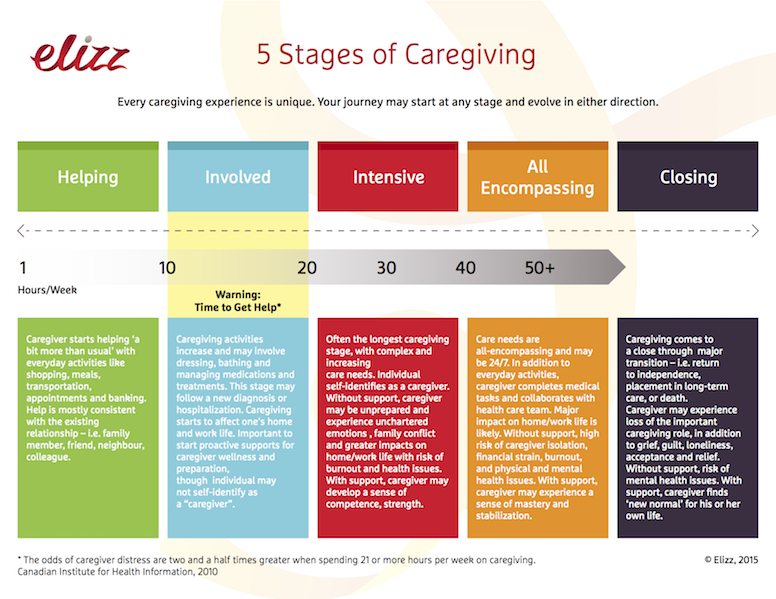 Which Elizz caregiver services are right for you? Dianna Bowes is the founder of Fabulous@50 and the Creative Director of Be Fabulous! Magazine. Dianna has won numerous awards such as the 2011 YWCA Women of Distinction Award (Turning Point category) 2014 Leaders of Tomorrow Business Award, 2015 Stevie Bronze - Canadian Entrepreneur of the Year. She is a creative soul, who loves connecting people and embracing life. Travel, great food, family, friends and a long bike ride on a sunny day is her definition of great life. For more information on Dianna Bowes click here. Gratitude: Helping Our Children Count Their Blessings Are you waiting for ‘Someday'?